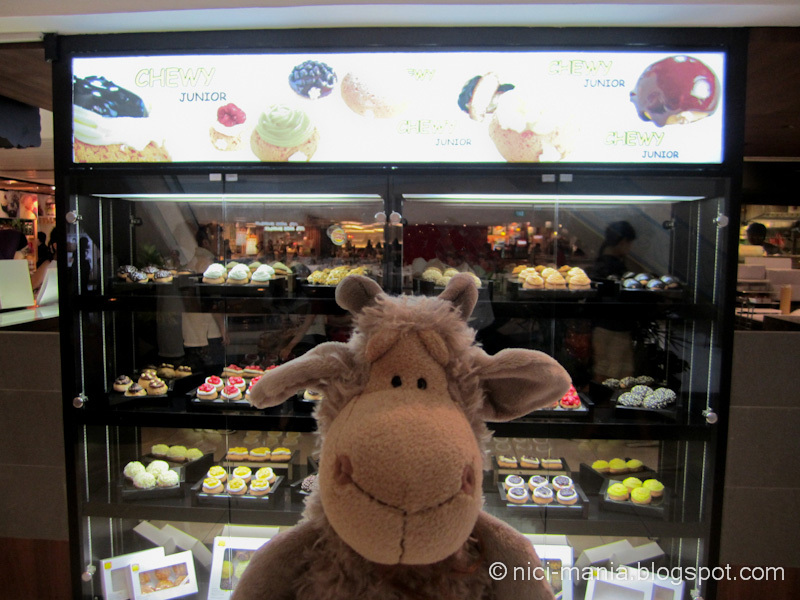 Jolly Gustav invades Chewy Junior and its chewy cream puffs! Chewy Junior is an outlet from Singapore selling chewy cream puffs. There are 5 Chewy Junior outlets in Singapore and many others in Jakarta Indonesia, Philippines and Vietnam. Chewy Junior is different from other cream puffs because they make it crispy on the outside and chewy on the inside with a generous stash of cream. 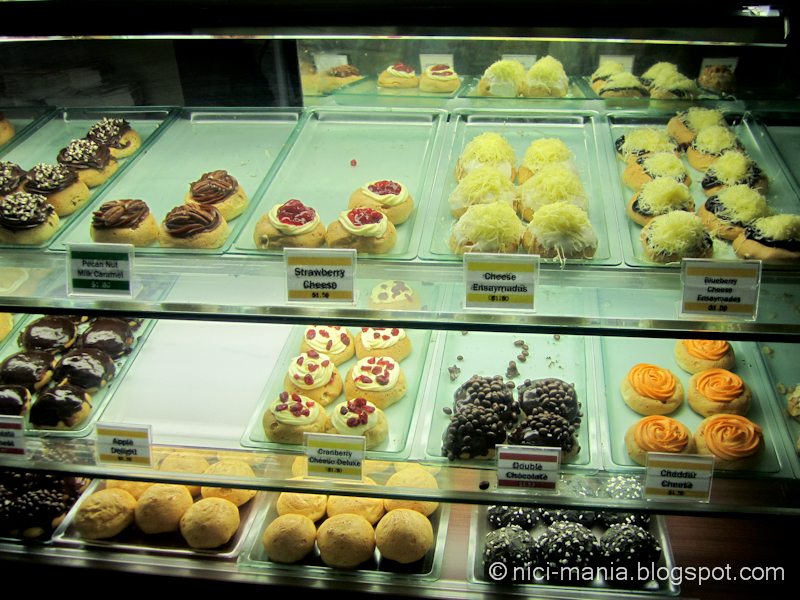 Thats why Chewy Junior named their cream puffs chewy puffs. 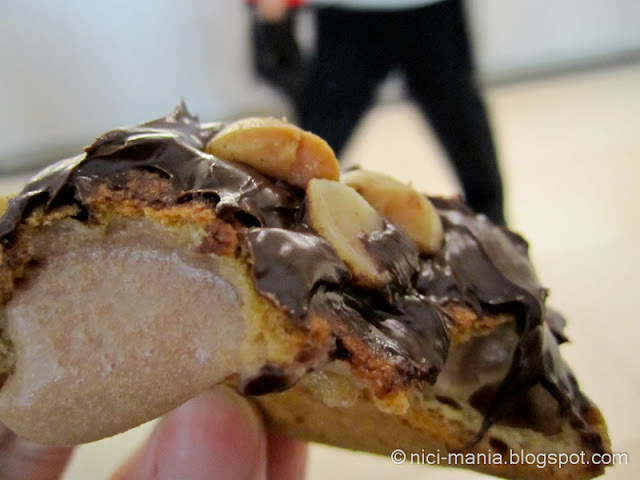 Chewy cream puff with generous coating of chocolate almonds. Looks absolutely delicious! Can you tell Jolly Gustav is drooling all over it? More delectable chewy cream puffs on the display window of Chewy Junior. 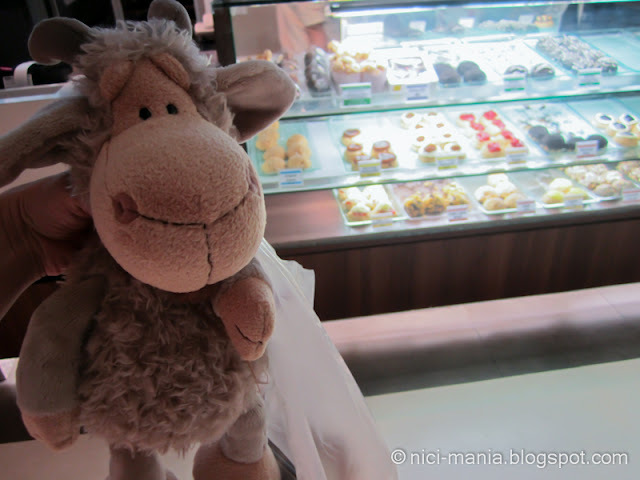 Today we are at the Raffles City outlet. 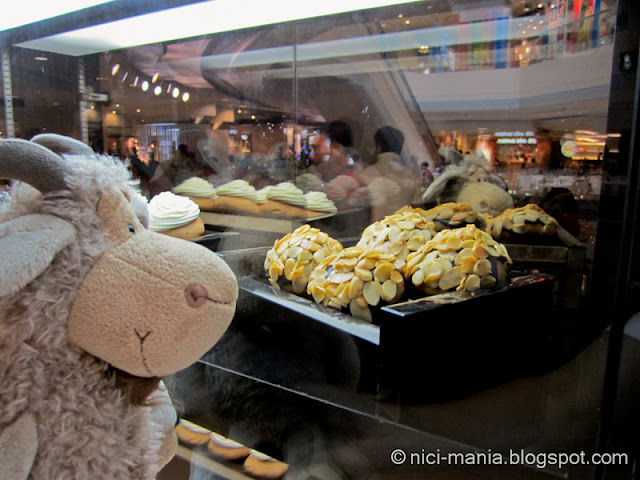 Jolly Gustav is attracting lots of curious eyes on him. 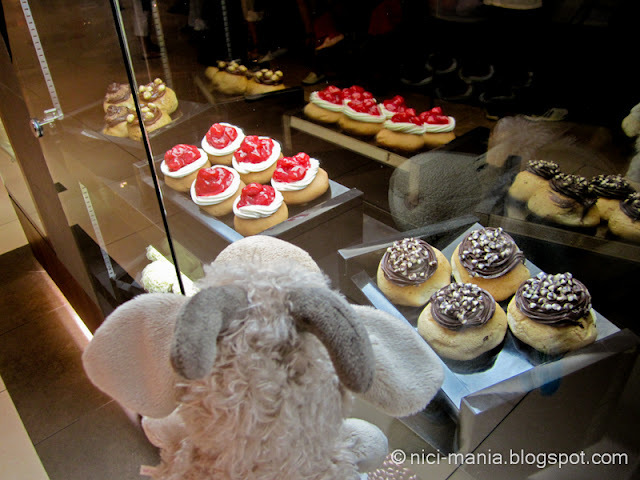 Its already considered sinful looking at all the cheese and chocolate toppings on the chewy cream puffs. There are some chewy cream puff sample available on top of the display counter of Chewy Junior. Take some! 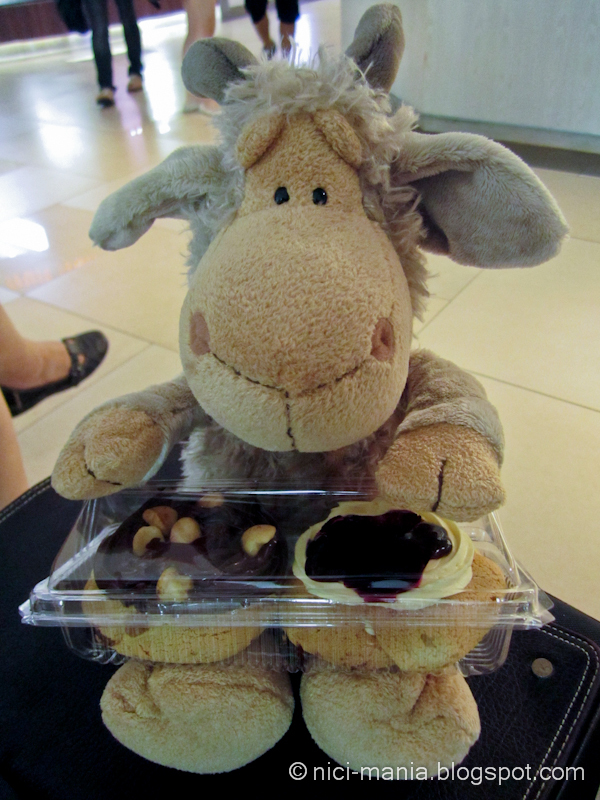 Gustav bought 2 chewy cream puffs, let's get a place to sit down and eat! Jolly Gustav presents - Chewy Junior's chewy cream puffs! 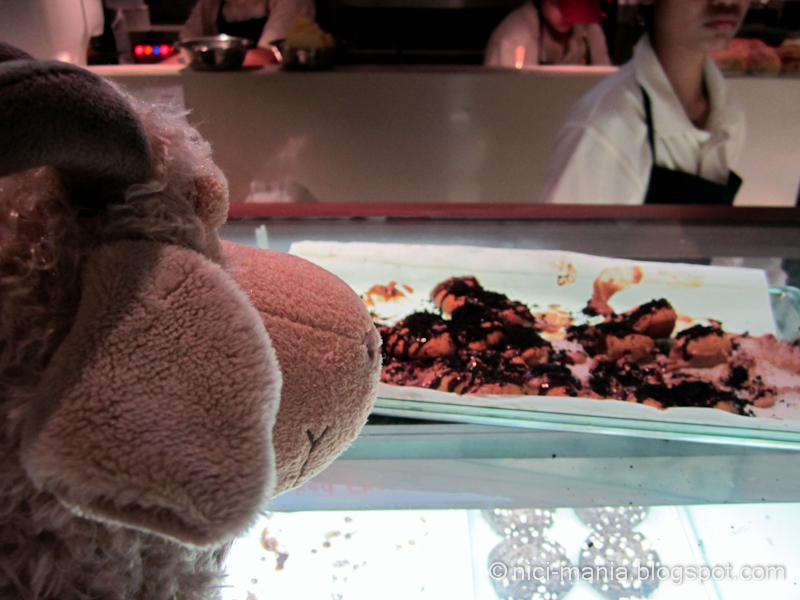 We got a chewy cream puff with macadamia nut toppings swimming in the abundant sea of chocolate. 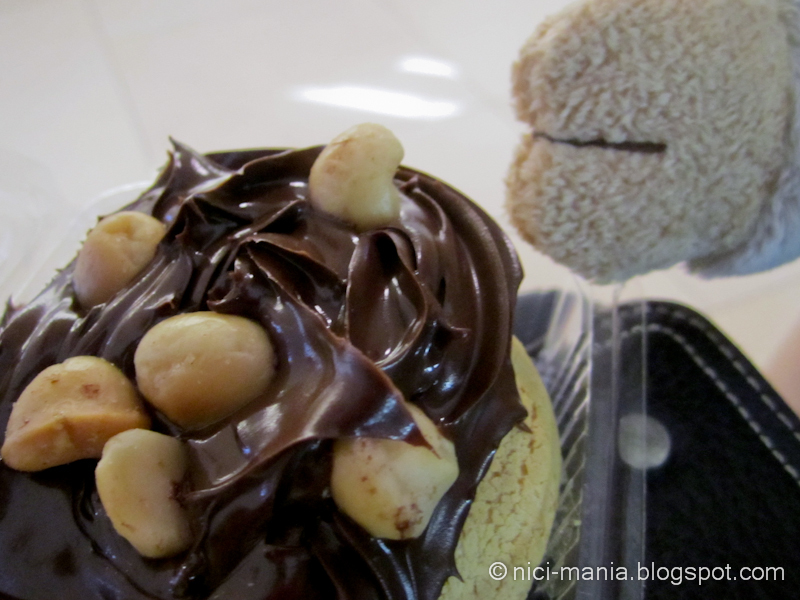 This one is called the Premium Chocolate Macadamia. 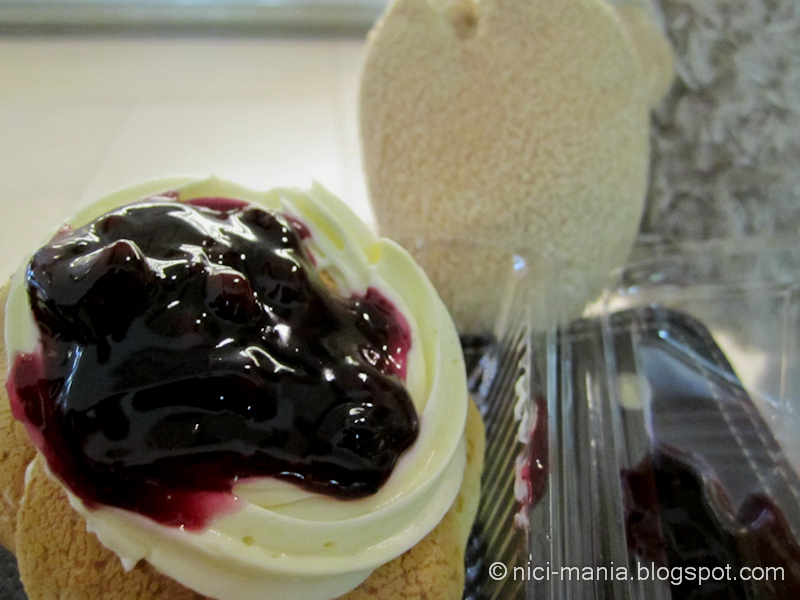 The other chewy cream puff we got was the Blueberry Cheese that comes with blueberry and cream toppings. Both the chewy cream puffs looks really sinful, so now the delima Gustav have is...to eat or not to eat? Gustav is an old goat, its natural he gets paranoid of his health issues. We went ahead and ate the chewy cream puffs! The Premiun Chocolate Macadamia has coffee flavored cream inside. 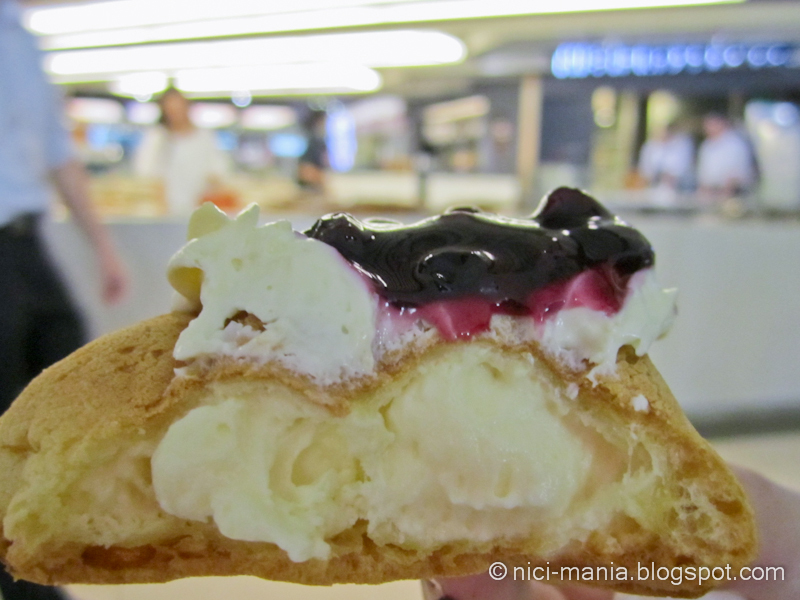 The Blueberry Cheese chewy puff has cream cheese inside. 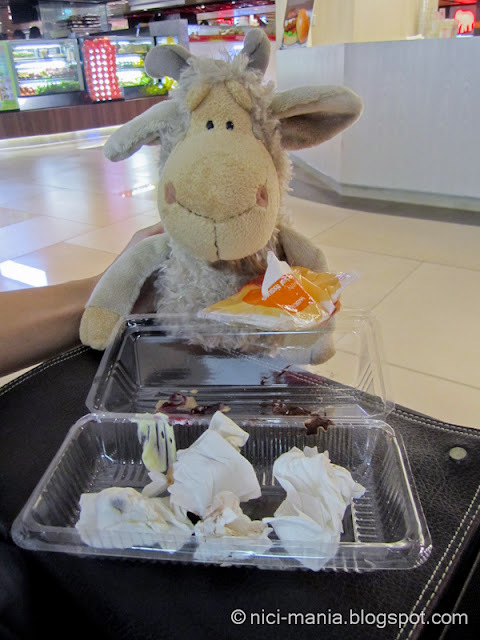 This is yummy if you love cheese! Please prepare loads of tissue when eating Chewy Junior cream puffs, the cream inside gushes out uncontrollably with each bite that you take. You have been warned! 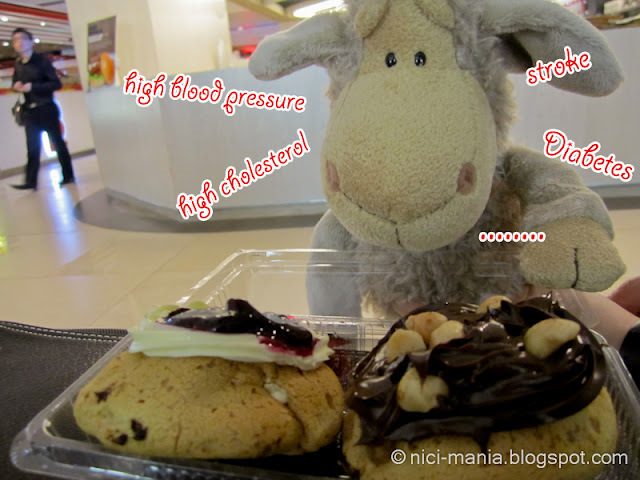 The chewy cream puffs at Chewy Junior ranges from $1.50 to $1.80 depending on let's say, how sinful it is. 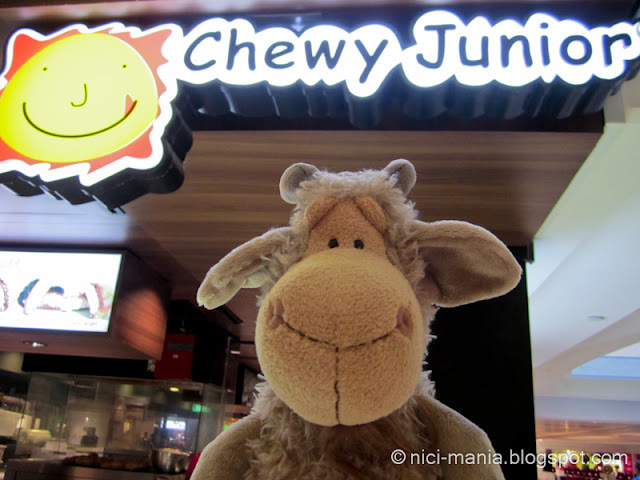 You can easily find Chewy Junior at Bugis Junction, Raffles City or 313 Orchard Somerset if you are in town and even more Chewy Junior outlets can be found if you are in Indonesia. Seeing all this makes me hungry, too much temptation haha. 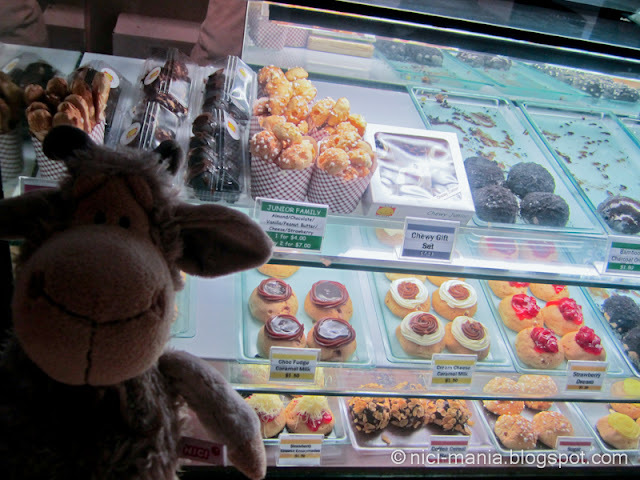 OMG, I thank God there are not Chewy Junior stores in Spain, I would be very fat!!!! But elsa is so young (-looking)!!! !